Chemtura Corporation is a global corporation headquartered in Philadelphia, Pennsylvania, with its other principal executive office in Middlebury, Connecticut. The company focuses on specialty chemicals for various industrial sectors, and these are transportation (including automotive), energy, and electronics. Chemtura operates manufacturing plants in 11 countries. Its primary markets are industrial manufacturing customers. The corporation employs approximately 2500 people for research, manufacturing, logistics, sales and administration. Operations are located in North America, Latin America, Europe and Asia. In addition, the company has significant joint ventures primarily in the United States. For the year ended December 31, 2015, the company's global core segment revenue was $1.61 billion. Chief executive officer is Craig A. Rogerson who is also the president and chairman of the board of Chemtura Corporation. Chemtura Corporation is the successor to Crompton & Knowles Corporation, which was incorporated in Massachusetts in 1900 and engaged in the manufacture and sale of specialty chemicals beginning in 1954. Crompton & Knowles traces its roots to Crompton Loom Works incorporated in the 1840s. In the late 1800s, Worcester, Massachusetts was a leading manufacturing center that attracted inventors and manufacturers. 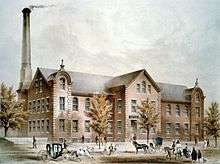 Both William Crompton and Lucius J. Knowles made the city their home and opened their respective loom companies there. Both were the top loom manufacturers in the world. However each company based the method of weaving on a different premise. The companies later merged (in 1879), becoming one entity known as "Crompton & Knowles Loom Works". Still supplying the world market, the new company now applied both theories of weaving. Meanwhile, in 1843 Charles Goodyear formed the Goodyear Metallic Rubber Shoe Company, Connecticut. A year later he patented the vulcanization of rubber. Goodyear's company then became one of nine companies that formed the founding of the United States Rubber Company in 1892 by Charles R. Flint also in Naugatuck, Connecticut. The rubber company manufactured a large array of products through two world wars, the Cold War, and became the Uniroyal company (Uniroyal Incorporated) in 1961. In 1986, Uniroyal Chemical Company was formed as a subsidiary of Avery Inc. Then, in 1989, Uniroyal Chemical Company Investors Holding bought Uniroyal Chemical Company from Avery and became Uniroyal Chemical Corporation. In 1996, Uniroyal Chemical Corporation went public and merged with Crompton & Knowles. In 1999, Crompton & Knowles merged with Witco to form Crompton Corporation. In 2005, Crompton acquired Great Lakes Chemical Company, Inc., of West Lafayette, Indiana, to form Chemtura Corporation. Additionally, Great Lakes Chemical Corporation still exists as a subsidiary company of Chemtura. By January 2014 the company had manufactured and marketed a new brominated polymer flame retardant, replacing the traditional hexabromocyclododecane (HBCD) flame retardant. By the end of January 2007 Chemtura completed stock acquisition and ownership of Kaufman Holdings Corporation with an all-cash transaction. The corporation operated as a debtor-in-possession (DIP) under the protection of the United States Bankruptcy Court for the Southern District of New York from 10 March 2009 through 10 November 2010. On September 26, 2012, Chemtura entered into a Business Transfer Agreement (BTA) with Solaris ChemTech Industries Limited, an Indian Company, and Avantha Holdings Limited, an Indian Company and the parent company of Solaris ChemTech. As provided in the BTA, Chemtura agreed to purchase from Solaris certain assets used in the manufacture and distribution of bromine and bromine chemicals for cash consideration of $142 million and the assumption of certain liabilities. In April 2013, Chemtura completed the sale of its Antioxidant business to SK Blue Holdings, Ltd, and Addivant USA Holdings Corp. for $97 million, $9 million in preferred stock issued by Addivant and the assumption by SK and Addivant of pension, environmental and other liabilities totaling approximately $91 million. Additionally, Chemtura paid $2 million in cash as part of a pre-closing adjustment. On May 15, 2013, Chemtura purchased the remaining 50% interest in DayStar Materials L.L.C. from its joint venture partner, UP Chemical Company. As a result, DayStar became a consolidated entity. The purchase price was $3 million in cash which approximated the fair value of the remaining share of the assets and liabilities, primarily inventory and fixed assets, as of the purchase date. In addition, Chemtura reimbursed UP Chemical for a $3 million loan they had made to DayStar. In December 2013, Chemtura completed sale of its Consumer Products business, including dedicated manufacturing plants in the United States and South Africa, to KIK Custom Products Inc. for $300 million and the assumption by KIK of pension and other liabilities totaling approximately $8 million. On April 16, 2014, Chemtura entered into a "Stock and Asset Purchase Agreement" to sell its Chemtura AgroSolutions business to Platform Specialty Products Corporation for approximately $1 billion, consisting of $950 million in cash and 2 million shares of Platform’s common stock. The sale became final on November 3, 2014. For the year ended December 31, 2015, the company's global core segment revenue was $1.61 billion. Chemtura operates in various industries including automotive, construction, electronics, lubricants, packaging, plastics for durable and non-durable goods and transportation Most products are sold to industrial manufacturing customers for use as additives, ingredients or intermediates that add value to their end products. Additionally, the company considers itself a strong competitor in the global market, based on its ranking of its products within given sectors as defined by sector industries and operating segments. The company currently has two reporting segments: Industrial Performance Products, includes the Petroleum Additives and Urethanes businesses; Industrial Engineered Products comprises the Great Lakes Solutions and Organometallic Specialties businesses. This segment markets synthetic lubricants and greases, synthetic basestocks, lubricant additives, and urethanes. This segment markets brominated performance products, flame retardants, fumigants, and organometallics. The company has plants in 11 countries, in locales such as Michigan, New Jersey, Arkansas, Germany, Italy, China, Taiwan, Mexico, Brazil and the United Kingdom. Firemaster 550 is one of Chemtura's brominated flame retardants. It is marketed as a flammability-decreasing additive for polyurethane foam used in upholstered furniture. As polyurethane foam ages and breaks down into fine dust, additives like Firemaster 550 can leach out and be absorbed, inhaled, or ingested. In a 2012 investigative series, the Chicago Tribune reported that a team of researchers detected harmful effects from Firemaster 550 at levels that were significantly lower than those used in the studies conducted on behalf of Chemtura. In response to the studies linking flame retardants to accumulation in humans and resulting potential harm, California Governor Jerry Brown proposed a regulation phasing out flame-retardant chemicals in furniture. On January 15, 2013, Chemtura filed a lawsuit in Sacramento County Superior Court attempting to force the State of California to leave the old standards in place. In that lawsuit, the company alleges that Chemtura would be irreparably harmed if the proposed new regulation were not rescinded. In November 2013, Governor Brown's Office announced publication of the new flammability standards, with mandatory compliance scheduled to begin on January 1, 2015. In mid-January 2014, Chemtura filed a lawsuit against the state of California alleging the (California) Bureau of Electronics and Appliance Repair, Home Furnishings, and Thermal Insulation failed to comply with its legislative mandate by issuing a revised fire safety standard that does not address the risk of ignition from open flame ignition sources. On September 30, 2014, California Governor Jerry Brown signed a bill requiring upholstered furniture labeling indicate whether the product contains toxic flame-retardant chemicals. This labelling requirement has triggered demand for furniture free of flame retardants. 1 2 3 4 5 6 "Chemtura Corporation Files Form 10-K". GlobeNewswire - Chemtura. February 22, 2016. Retrieved 2016-03-11. ↑ "Chemtura Reports Fourth Quarter 2014 Financial Results". Nasdaq. February 25, 2015. Retrieved 2015-03-19. 1 2 3 4 "Chemtura CORP - FORM 10-K - EX-31.1 - EXHIBIT 31.1 - February 22, 2016". GetFilings.com. February 22, 2016. Retrieved 2016-03-11. 1 2 "About Chemtura". Chemtura.com. 2015. Retrieved 2015-03-19. 1 2 Rudnick, Leslie R. (2009). Lubricant Additives: Chemistry and Applications, Second Edition. CRC Press (Taylor & Francis). pp. 40, 237, 238 (timeline), 439,. ISBN 9781420059649. 1 2 3 Plunkett, Jack W. (July 2008). Plunkett's Chemicals, Coatings & Plastics Industry Almanac 2009. Houston, Texas: Plunkett Research, Limited. ISBN 9781593921255. 1 2 3 4 This article incorporates public domain material from websites or documents of the United States Government. "FORM 10-K" (online - PDF). For the fiscal year ended December 31, 2013. U.S. Securities and Exchange Commission. 24 February 2014. Retrieved 19 May 2014. ↑ "Company & People". Wall Street Journal. Dow Jones & Company, Inc. Retrieved 16 June 2014. ↑ "Financials". Wall Street Journal. Dow Jones & Company, Inc. Retrieved 16 June 2014. 1 2 3 4 "Historical Timeline". Chemtura Corporation. Retrieved 20 May 2014. ↑ "Crompton & Knowles Looms" (Free PDF download). Crompton and Knowles Loom Works Collection. Worcester Polytechnic Institute. 22 May 2013. Retrieved 25 May 2014. ↑ Pederson, Jay P. Gale Directory of Company Histories - Chemtura Corporation. International Directory of Company Histories. 91. The Gale Group, Inc. ISSN 1557-0126. ↑ Somma, Ann Marie. "Charles Goodyear and the Vulcanization of Rubber". Connecticut History.org. Connecticut Humanities and University of Connecticut. Retrieved 25 May 2014. ↑ Simons, Martha Ann (16 February 2014). "Cradle of the Rubber Industry". The Naugatuck Historical Society. Retrieved 25 May 2014. ↑ NNDB (2012). "Witco Corporation" (Bibliography). Bibliography. Soylent Communications. Retrieved 19 May 2014. ↑ NNDB (2012). "Great Lakes Chemical". Bibliography. Soylent Communications. Retrieved 19 May 2014. ↑ "Company Overview of Witco Corporation". Bloomberg Business Week. 2014. Retrieved 19 May 2014. 1 2 3 4 5 6 7 8 This article incorporates public domain material from websites or documents of the United States Government. Quarterly Report, Chemtura Corporation (30 April 2014). "Form 10-Q" (Free PDF download). For the quarterly period ended March 31, 2014. Securities and Exchange Commission. pp. 6–10. Retrieved 24 May 2014. ↑ "Chemtura Completes Acquisition of Kaufman Holdings Corporation". OEM/ Lube News. Lubrication Technologies, Inc. 5 February 2007. Retrieved 16 June 2014. ↑ "Kaufman Holdings - Acquisition Completed". Chemtura News & Events. Chemtura Corporation. 30 January 2007. Retrieved 16 June 2014. Press release. ↑ Dealbook (19 March 2009). "Chemtura Files for Bankruptcy". New York Times. New York City: The New York Times Company. Retrieved 24 May 2014. ↑ De la Merced, Michael J. (6 March 2009). "Chemtura Hires Restructuring Advisers". New York Times. New York City: The New York Times Company. Retrieved 24 May 2014. ↑ Tan, Gillan (16 April 2014). "Chemtura to Sell Agrochemicals Business". Wall Street Journal. Dow Jones & Company, Inc. Retrieved 15 June 2014. ↑ "Chemtura Completes Sale of Its Agrochemicals Business to Platform Specialty Products Corporation" (Press release). The Wall Street Journal. 3 November 2014. Retrieved 22 December 2014. 1 2 3 This article incorporates public domain material from websites or documents of the United States Government. "FORM 10-K" (online - PDF). For the fiscal year ended December 31, 2013. U.S. Securities and Exchange Commission. 24 February 2014. pp. 7–11. Retrieved 19 May 2014. ↑ Lee, Stephanie M. (17 January 2014). "Flame-retardant maker sues over new Calif. law". SF Gate. Hearst Communications, Inc. Retrieved 1 June 2014. ↑ "California Sued Over New Flame Retardant Standards". CBS Sacramento. CBS Radio, Inc. 17 January 2014. Retrieved 1 June 2014. "Fourth Quarter 2014 Financial Results". Chemutra. 2015. Retrieved 2015-03-19. Wikimedia Commons has media related to Chemtura.